This chart is pay-what-you-want. If you’d like to leave a suggested donation of $1.99, we would greatly appreciate it. If you’d like to download for free, simply enter $0 in the price field. To change a song that is currently in a female led key to a male led key, use the left column. Find the original key of the song, and the scroll to the right to see the low/medium/high suggestions for the male key. Technically what we’re doing is moving the song up 5 steps. This is a rule of thumb that works on a vast majority of song, but it may not work on every song. You’ll need to experiment a bit to see if it fits your voice. As an example, let’s say you have a female-led song in the key of D (What A Beautiful Name by Hillsong would be an example of this). If you want to change that to a male-led key, find D on the column on the left. We can see that the mid suggested key would be G (5 steps up from D). This means if you transpose the song from D to G, it should be suitable for a male lead. If G is too high, try F. If it’s too low, try A. To change a song from a male led key to a female led key, you use the same basic workflow, only this time we’ll use the column on the right, and technically we’re moving the key down 5 steps. So take a male-led song in the key of A (Good Good Father, for example). To change it to a female key, you could start with E. If that’s too high, choose D. If E is too low for you, try F or F#. OK, Now I know what key I want to transpose to – how do I transpose it? Transposing a song is actually pretty easy. We’ve created another free chart called the Chord Number System that will allow you to quickly and easily transpose any song into any key. Download and learn how to use the Chord Number System Chart here. 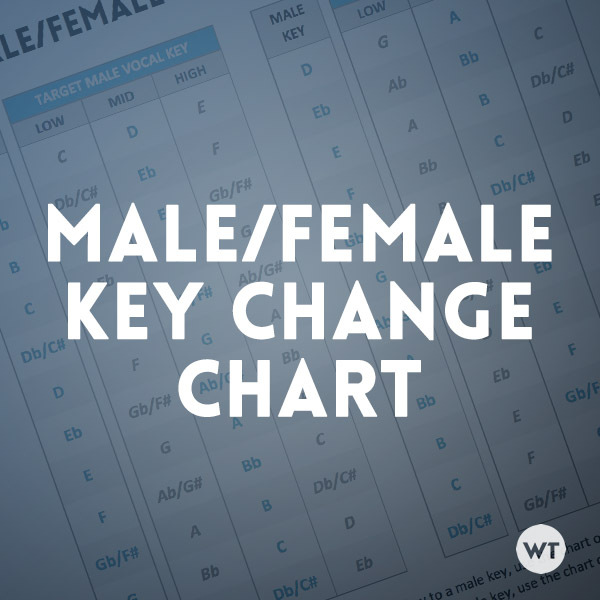 The Male/Female Key Change Chart allows you to quickly and easily convert a song from a male-led key to a female-led key, or from a female-led key to a male-led key. Hey Brian this is a great resource for worship teams, thanks for making this tool available for us. One thing I wanted to ask/suggest is a similar chart for transposing songs to maximize congregational participation. I know there is not a magical key to accomplish such a goal for every worship song out there but it would be helpful to have a guide that helps worship leaders/teams move in that direction in serving the body. Hi Andrew – this is an interesting subject (keys suitable for a congregation) – let me put some thoughts together on that one. Thanks! Totally agree! That would be incredibly helpful! Really nice! !This is awesome Brian,Thanks!! Hi Brian, one challenge I am facing when I transpose male lead worship songs to female is how the songs are being sung with octave ranges. Many songs being sung today have octave changes between the verse, chorus and Bridge. The verse starts low and then swings up an octave in the chorus. When I transpose, I start with getting the highest part of the song in my range, which then puts the verses so low that I can’t imagine congregants being able to sing it comfortably. How do you find the sweet spot vocally with so many songs being written like this today?